The LG G6 comes with a rear camera that is equipped with a wide-angle lens that provides 125-degree field of view. LG has conducted a poll where 132 participants share their opinions about what being the most useful for them shooting with the LG V20 wide angle camera. According to the poll results that ran on Facebook and Google+: 43.94% said that they use it for taking grand landscape shots, 35.61% say that they found it useful for taking group selfie and 20.45% say the the found it useful for taking photos with a wider view in a small room. The V20 came with dual-lens camera, one camera provided a 135-degrees FOV. 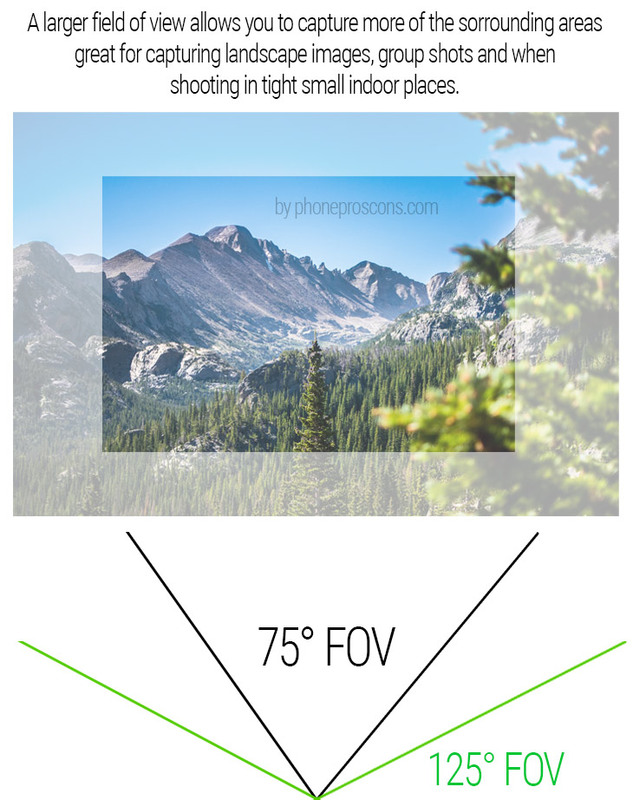 He is an image I made to illustrate the difference between a regular wide angle that you get with many smartphones and the wider 125-degree one. The LG G6 comes with one camera that can provide a 125-degree field of view, a bit less wide than the V20, but still wide enough to answer the same demands. Many rear cameras on most phones come with a focal length equivalent to around 26mm or 28mm. A 26mm translates to 79.5° FOV and 28mm focal length translated to approx. 75.4° FOV. As you can see, most of the rear cameras on smartphones just a much narrower field of view. Having a dual-lens camera like the one in the V20 also gives users the option to choose which camera they prefer shooting with, so it's not that they are limited to only that very wide FOV, they can choose to shoot with the other lens that provides a 75-degree FOV. The same goes with the LG G6. The G6 comes with a dual-lens camera as well, which also gives you the option to choose between a standard field of view and a 125-degree field of view. Users will be able to alternate between wide angle and normal camera. The LG G6 dual-lens camera will very useful for taking group shots, landscape photos and when shooting in tight indoor places. I personally love shooting with ultra-wide angle lenses with my DSLR cameras, because it gives a really unique and artistic results. I use it mainly when I travel to other countries and take pictures of landscapes and interiors there. I just found it very useful. Another great thing about this setup is that you can zoom in and out continuously between the two focal lengths. As you can see, the main benefits of having a camera with 125-degree field of view cannot be ignored. This will help you take more artistic and beautiful landscape photos, group shots and when shooting in tight and small indoor places. This is so much better than the Huawei P10 camera. With such a wide-angle lens I won't need to shoot panoramic images ever again, so annoying to shoot them. You can get some really creative shots with the wide-angle lens. I just hope that it works like other dual-lens camera phones with a smooth transition between, like an optical zoom, instead of just switching between normal and wide-angle, which seems a bit awkward.